Meet RICO SUAVE. 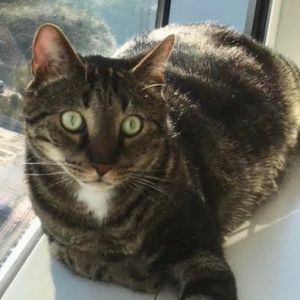 He is a 1½ year old BROWN TABBY male who was saved from the streets of Brooklyn. Rico is a BIG BOY! He weighs about 19 pounds and he is a real HUNK. Rico is being fostered in Westchester, NY. His foster mom is quoted as having said the following about Rico. “He’s really been the PERFECT cat guest. He doesn’t bother my plants or furniture. He uses all his scratching posts. He’s not a lap cat but will let us PICK HIM UP for a HUG and head scratch. He likes to be BRUSHED too and DOESN'T SHED MUCH. He’s SOCIAL when he wants to be and will join us while we are hanging out. Otherwise he’s CONTENT to relax in a few of his favorite spots. Rico is SUPER PLAYFUL and plays hard, so no young children, please! Rico is GOOD with cats that are not the submissive type and "calm" dogs. Rico is super active, so he requires space where he can run around. If you would like to meet Rico, he is available for “Meet and Greets.” He is neutered, UTD on shots, and FIV/FeLV negative.